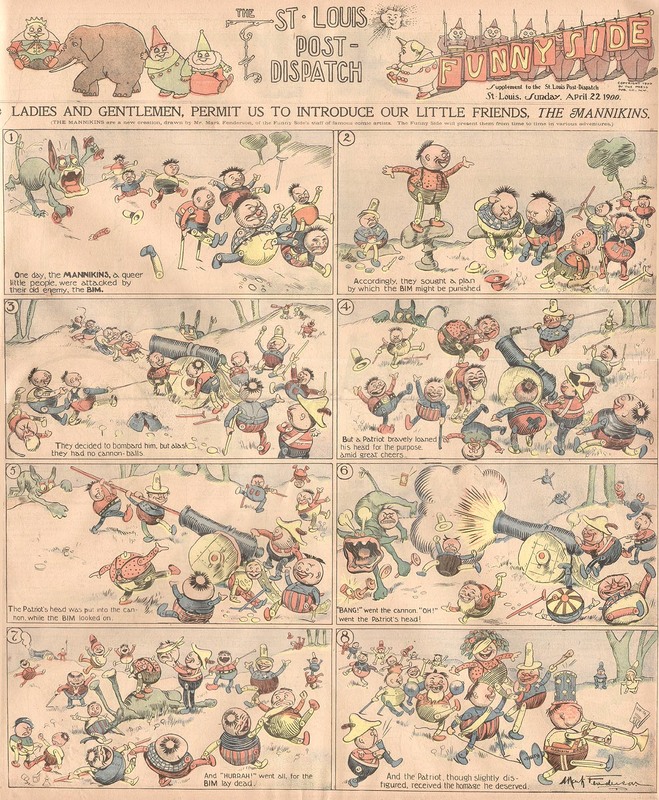 Sunday, September 22 1907 -- For the Sunday magazine section Herriman supplies bookend illustrations to a feature editorial, one presumably produced out of New York. The editorial is discussing what was apparently a common practice at the time of employing young boys as industrial chimney sweeps. 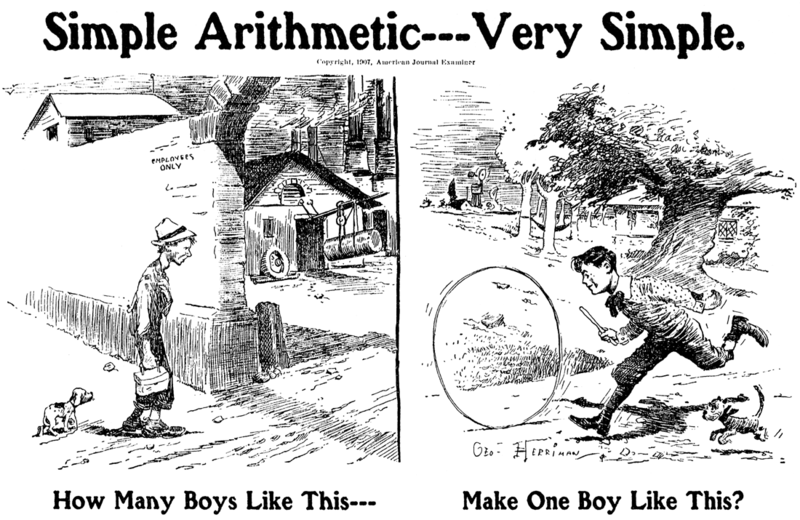 According to the editorial machinery was available to clean industrial smoke stacks, but it was cheaper to employ small boys to climb up inside and clean them by hand. The first illustration, "Simple Arithmetic", echoes the editorial writer's point that the children of rich businessmen lead idyllic lives as a result of the money saved by ruining the lives of other boys. The editorial goes on to admonish businessmen to sacrifice a small part of their profits to end this practice. 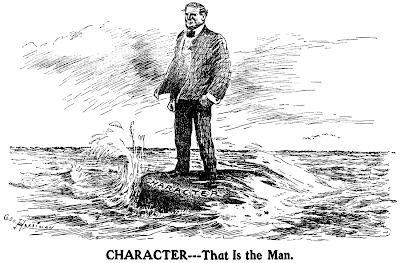 Character, the writer says, is based on looking at the big picture, not merely at the bottom line of an income statement. We just visited with Harry "I like big heads and I cannot lie" Lewis last week and here he is again. 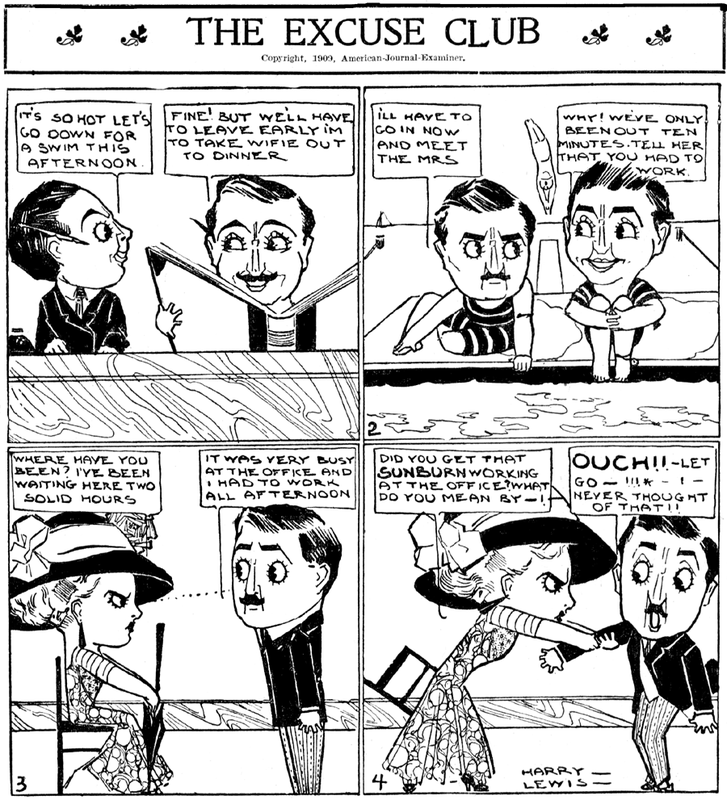 The Excuse Club was his very first foray into comic strips. 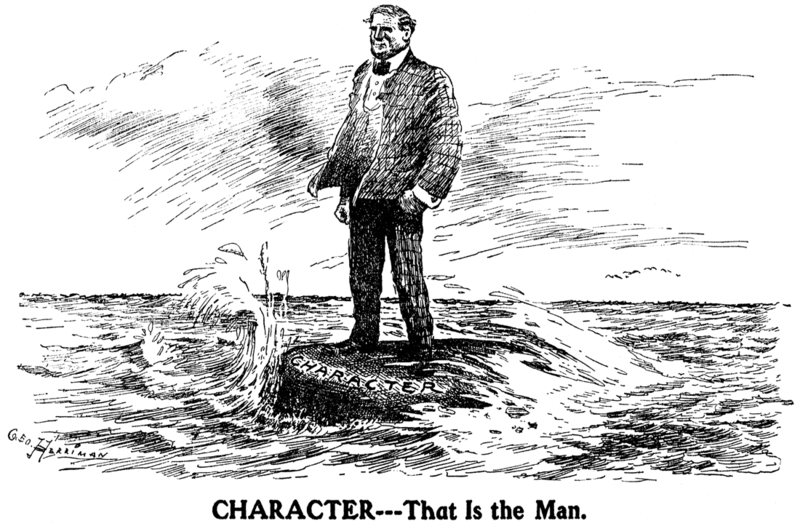 Lewis actually took this feature over from Charles Wellington, who turned it over to him after doing a few installments from February 24 to March 11 1909 in the New York Evening Journal. 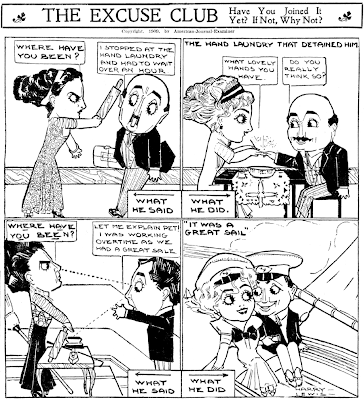 Lewis then took over and continued the series until February 5 1910, a very impressive one year run when you consider that the strip really only has one rather weak gag formula. These strips afford me a good opportunity to point out that in the old days the evening papers had a lot of latitude about their subject matter. These PM papers were designed to entertain men on their way home from a day of work. The papers sold on the strength of the day's sports scores, racy and shocking headlines, and a line-up of comics definitely not designed for the tykes who read the Sunday funnies. Notice in the above samples that Lewis is not just obliquely hinting at marital infidelity, he's laying it right on the line. Those sorts of shenanigans generally wouldn't fly in the Sunday funnies, but were perfectly fine in the evening paper. This sort of risque material petered out in the teens and twenties due to a lethal combination of two forces. 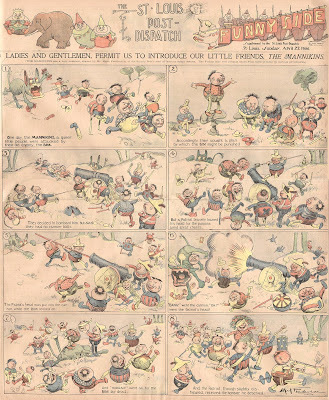 First was the onset of the mass syndication of daily comics. 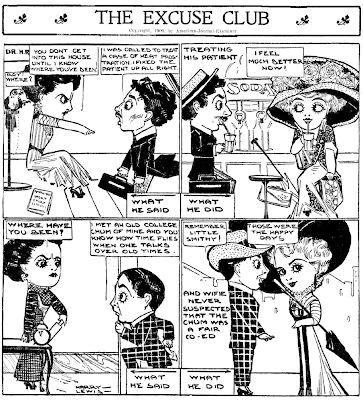 Sophisticated New Yorkers could chuckle over a racy strip like The Excuse Club, but the rubes out in Sioux City, Tulsa and Sheboygan didn't take kindly to such fare. 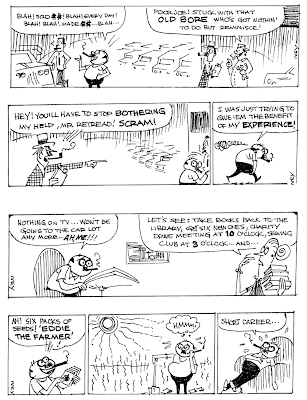 Strips that didn't offer universal appeal weren't worth syndicating, so they died off. Second was the coming of the car culture -- people who bought evening papers to read on the bus/train/trolley ride home were getting cars in the teens and twenties, and they no longer had the luxury of reading a paper on the way home. With the evening papers dying out, adult-oriented comic strips had no convenient market to capture anymore. Anyway, This oddity, Marvelous Mike, is the story of how the sitcom-style daddy-is-a-dope Crump family deals with a mysterious foundling. Little Mike is a loquacious prodigy, a super-genius disguised as a baby. The kid's haunted! The complications evolve from his misbegotten efforts to help his less-than-brilliant father. Eventually, the little poindexter feels his new father resents him, and runs away from home. In the course of retrieving him, Daddio gets into an accident with the kid in which he receives a severe blow on the head! When Mike revives, he no longer can talk, he can only gurgle baby talk. This development, the strange way Kuwahara decided to end the strip, is treated as a wonderful thing, as now Mom and Sis can have the fun of teaching him his ABC's! Gee, I'm wondering if the kid suffered some brain damage! Thanks again to Cole Johnson for submitting both words and pictures! It has been brought to my attention that the entire run of Marvelous Mike has been posted on the It's The Cat Blog, so if you're appetite has been whetted, click on over and enjoy the whole series. 'Tis a rare day at Stripper's Guide when we get to offer both the beginning and ending weeks of one of our obscurities, much less from beautiful syndicate proofs, but we're in the catbird seat today. Or rather, today and tomorrow since I'm going to stretch this out over two posts. Today we have the initial two weeks of Marvelous Mike, which began on March 5 1956. The strip was one of five winners in a contest conducted by United Feature Syndicate. Bob Kuwahara's Marvelous Mike came in fourth. You can read more about the contest in this post. Tomorrow we'll have the final rather bizarre week of the strip, along with Cole Johnson's comments on the series. All the scans, by the way, were provided by Cole, to whom much thanks! This was a great one, I'd like to read them all...looking forward to tomorrow's post! Could you please hold off on the final weeks of Marvelous Mike? I've been faithfully posting a run of Mike from St. Louis Post-Dispatch microfilm for more than a year now, and I've almost come up to the final 6 weeks of the strip. I have had a few missing dates in my run, which I appealed to the readership to supply. Had I known that Cole had a syndicate proof run of the strip, I would never have set out to reprint them all. I can double up on the strips and reprint them all in the next three posts. I hope you can help. Sorry, I don't get out much and didn't realize you were running the strip on your blog. I've already got part 2 of this post queued and ready to go, but there's no reason not to put it off for a few days. How long do you need? You're welcome to use my proof scans on your blog if you want to give your readers a treat for the final week and a half of the strip. Contact me privately. When I think of mannikins, I think of those fashion figures in clothing stores. But a check of the dictionary reveals that the official definition is simply of a jointed model of a body. So that, I guess, explains the characters in Mark Fenderson's Mannikinland, a cute little fantasy strip that ran in the New York World from April 22 to August 12 1900. Ken Barker's New York World index in StripScene relates this series to one done in 1898 by John Booth, but Cole Johnson, who supplied the scans, tells me that the two series are unrelated. Those are fantastically weird! Thanks again Allan and Cole. In the days when stereotypes were a favorite target for cartoonists, race and national origin weren't the only games in town. Religious persuasion, too, could put you in their sights. Though usually this was limited to the most exotic religions, like Hinduism, on a few rare occasions cartoonists drew a bead closer to home. 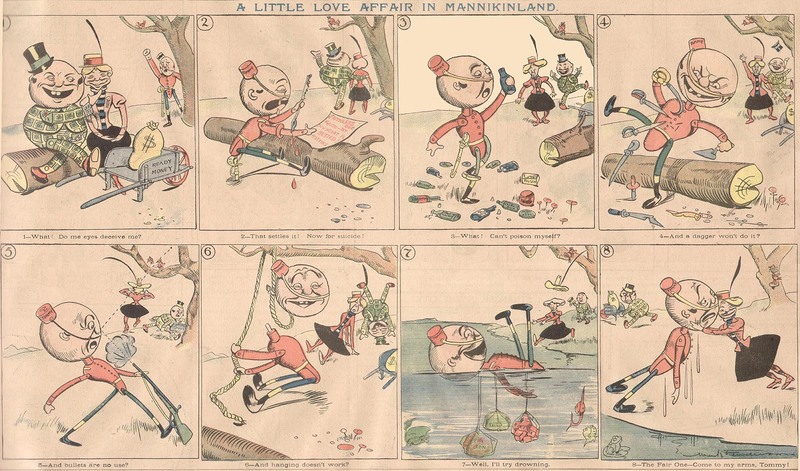 Here's a rare series from the pen of the grand master himself, Winsor McCay. Aren't You Glad You're Not a Mormon ran just three times between May 13 and 21 1912 in the pages of the New York American. 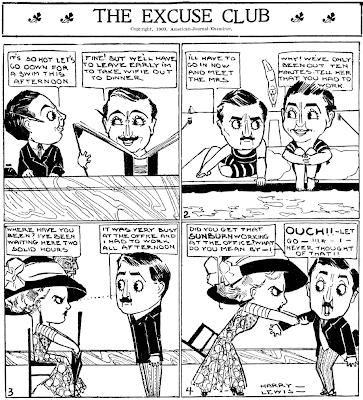 In the series McCay focused on that most touchy issue of polygamy. He treated it as a waking nightmare, sort of a Dream of the Rarebit Fiend sans cheese and beer.